Aswan, provincial capital situated at the first cataract (rapids). The town was already in ancient times Egypt’s gateway to and natural trading-center for the African interior. 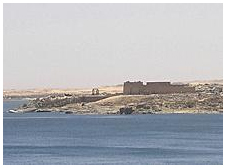 Today the city of Aswan enjoys the reputation of being an ideal winter health resort, because of its dry climate, pure air and almost perfectly blue sky. Sail to Kitchener Island to see the thousands of trees and shrubs brought to Egypt from all over the world. Also on an island, the Mausoleum of the great Aga sits high above the river banks. The climb is steep but well worth it to see an unparalleled view of Aswan and surroundings. On another island, these temples were dismantled and moved to save them from water inundation when the High Dam was built. Colonnades, a superb Sound, flank the largest temple, dedicated to Isis and her son Horus. Sound & Light Show is presented nightly. See the Unfinished Obelisk abandoned by ancient stone cutters because of a flaw; it is 25 feet long and weights about 1170 tons. Obelisks were transported from Aswan to other parts of Egypt via the Nile, where artists completed the task of adorning the huge monoliths. A modern achievement of great magnitude for Egypt’s history. In Abu Simbel, Ramses II built a monument to honor his favorite wife, Nefertari. Situated on the West Bank, the sanctuary was designed with extraordinary precision to catch rays of the rising sun twice each year - 20 February and 20 October. Also threatened by the High Dam, the massive monument was cut and rebuilt,65 meters above its original level - like a giant jigsaw puzzle.